I have written this post a year ago. Yesterday, one of my LinkedIn connection asked me to re-post it again to help others about usefulness of maintaining a diary. The benefits of writing are many. Some of them are: improvement in memory, better control over thoughts, and above all becoming a good friend with one selves. Everyone can have their own opinion about this article, but for me, writing diary is definitely been effective year after the year. You can see the recently finished day by day diary of the 2015 as the profile picture of this post. And below is an image of my diary of the year 2014. And this was the post, written a year ago. I have written about the documentation in Chinese history at one of my blog post at The China Daily. I have ended my post with the question on how we can use ‘documentation’ in our everyday life. I was thinking, how one can start documenting? Definitely, documentation is no easy task. It took more than 8 pages to describe, what I have enacted in 10 minutes of session in one of my story telling meetup. My attention turned once again to Chinese history and then my own life. In many times of Chinese history, the writings were written by normal people expressing their grief, sorrow, happiness as well as their day to day life style. Something like what we can sum up like writing a ‘diary’. I am writing diary from quiet few years but somehow, I felt the essence of it in changing ourselves while going through those historical moments. So, how writing a ‘diary’ can help you, especially to us, the 21st century generation! Keeping you in the conversations: I am not the one who has predicted this, but at least can witness this on the continuous basis. Conversation are somehow dying among the human beings with the arrival of technology in our personal life. The place of our emotions, laugh being taken by wall posts, posting things on social media and sitting most of the time on the internet to find answers which can be resolved just by simple conversations. In my view, we are stopping becoming our true self, by not expressing our selves truly. Typing something on a social networking website does not express about who we are? It just displays who we want to become, or how we like to be looked to maintain our social status (I may be wrong here, but just telling from my own experience). But when we speak(I am saying speaking) to someone or just to a friend, we are expressing ourselves in a much better way. As there is no option to edit comment or delete comment. Definitely, we cannot go back to 500 years back and stopped being tech friendly. But there are other ways to express, like if one can start writing diary (even few lines) on daily basis, then such conversation starts on slightly real basis. This is your diary, so one can write how the day went, what went wrong, what went right? Is there something memorable a person like to remember etc etc. It is an open space to share everything, as we are not compelled by the social status, ability to being look like someone else. While writing diary, person can be truly honest with him. Feeling relaxed: Many times, we cannot say what we want to say. One But we can try to write those thoughts in diary and stop them circulating them in our mind. Of course, this is not a solution to any problem but this can give us a relax state of mind. Writing diary just before going to bed, summarizing entire day’s experience is a good habit. A person can be totally in touch with his inner emotions as there is no one else to watch while penning down the thoughts. Try it yourself and let me know, if I am wrong! Becoming more disciplined: Writing diary on the regular basis, can prompt you to make better decision. I am not sure how it can work for others, but it certainly worked for me many times. While writing diary each day, many times I have thought of my actions (right/wrong) for a minute and realized that sometime I have wasted my time on certain activities too much. Sometime, I have felt that distraction of some sort has driven my attention from the main activity. Knowing such things helped in making plans to not to repeat such mistakes in future. This has indirectly helped me in planning my activities better 🙂 which could otherwise go unnoticed. Best book to read: I know this, you would be telling yourself,’ I am very bad in writing or i am not good in maintaining schedules etc’, like all kind of things. But believe me, writing diary is a good investment of time. It helps you in connecting you with your inner emotions, your soul without any fear of getting loose something. You will become friend of your own and feel better everyday. You can write almost everything about anything as long as you feel good about it. Believe me, once you start writing, there will be no end in sight. In fact, if you write continuously for more than 6 months than your own diary can be the best book for you to read during your free time. 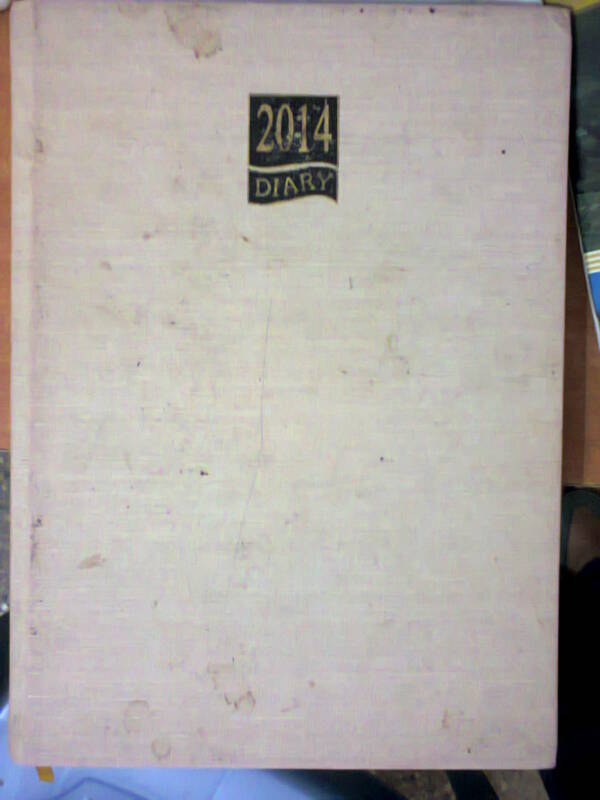 My diary: Indeed, I am writing the diary since 2013 on regular basis and made many changes to myself. I loved this habit and you can see my diary for the year 2014 (written daily) in the main picture of this blog post. New year resolution: So, may be, on the eve of this new year, may be take a resolution to start writing a diary every day!! And let me know afterwards, how do you feel about this experience.